The Logic Theorist (LT), the first running artificial intelligence program, demonstrated by Allen Newell, J.C. Shaw, and Hertbert Simon at Carnegie Institute of Technology. Newell and Simon began to create the Logic Theorist before the existence of the field of artificial intelligence itself. Simon was a political scientist who had already produced classic work in the study of how bureaucracies function and a Nobel Prize-winning theory of rationality. His background brought him insight into skills of critical thinking and decision making. After watching a printer output a map in the 1950’s, he hypothesized that machines working with symbols could make decisions. Extending this further, he wondered if computers could simulate the process of human thought. 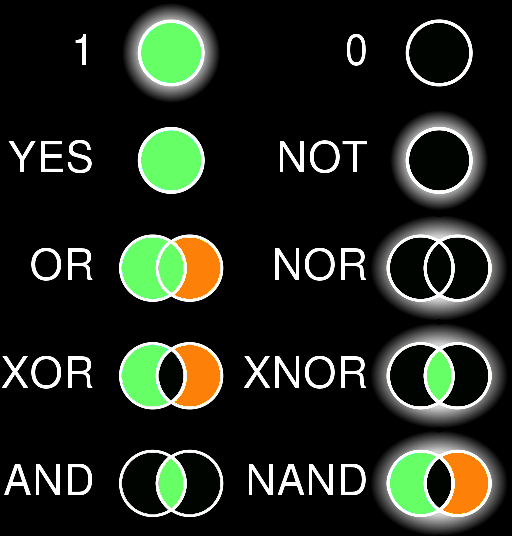 The diagram above shows the ways a computer interprets different various operators such as “YES” or “AND.” The circles and venn diagrams illustrate possible ways of interpreting information using the operators. “AND” means that the information is found in both quantities, not only one of them. Newell and Simon worked together in discussing how machines could “think” and created the Logic Theorist, a program to prove mathematical theorems from Principia Mathematica. Computer programmer Cliff Shaw helped in developing the program. In January 1956, we assembled my wife and three children together with some graduate students. To each member of the group, we gave one of the cards, so that each one became, in effect, a component of the computer program … Here was nature imitating art imitating nature. They showed the program could prove theorems like a mathematician would. The Logic Theorist soon proved more theorems from Principia Mathematica. Newell and Simon formed a lasting partnership, founding one of the first AI laboratories at Carnegie Tech and developing a series of influential artificial intelligence programs and ideas, including GPS, Soar, and their unified theory of cognition.